It’s officially spring, and that means fire pit season is just around the corner! Nothing like drinking a beer in the backyard with some friends, while you gaze deeply into dancing flame pondering your existence and the future of mankind. Boy, do we have a special addition for you. 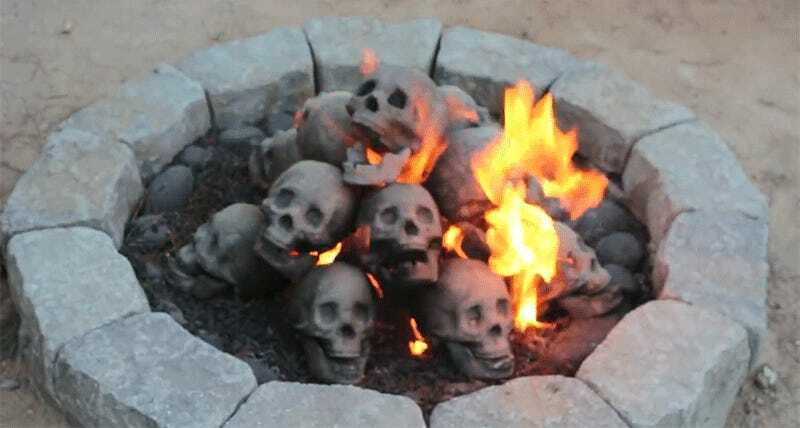 But a fireproof skull or six provide a Shakespearean—or just plain metal—vibe to your fire pit experience. These adult-sized noggins are made in America and designed to work with any propane or natural gas fire pit. It’s unclear how well they’d hold up in a classic, country-style wood fire, although the vendor on Amazon claims that the skulls are made of the same “type of ceramic material that NASA uses to test rocket engines on” and can withstand temperatures up to 3000-degrees Fahrenheit. They’re also heavy enough to withstand wind gusts, which is always a nice feature on any fire-related item, and they’ll also work in gas fireplaces. You really have to see these skulls to believe them. Imagine what fun it would be if you invited some friends over, pulled off the fire pit cover, and then confessed to being a serial killer—although obviously you would explain that you’re not really a serial killer, just a lover of all things macabre. The overall effect is creepy as hell. Except you don’t explain it or even mention it, then wait to see which of your friends runs for the woods first.